The second workout tales place on the top of a lava cliff on the Big Island of Hawaii. The workouts are easy to follow and are only 22 minutes long. They are designed for kids from walking age to 14, but even adults won’t be able to stay in their chairs. These workouts are a blast for the whole family. I surprised my grandchildren and daughter with the set and they love the workouts; in fact my daughter said she was a total fan of yours - nice surprise. Gilad would think about making anew kids workout dvd segment ..bit of an updated version would be fantastic also.. thanks again, very happy customer here. 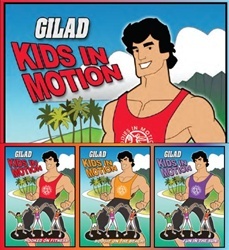 I ordered these for my kids, and they love Gilad as much as I do! My 7 and 9 year old will do several workouts with him EVERY night!